HMCB-102 | Size: 30 ml / 1 fl. oz. With 10% therapeutic grade liposomal Coenzyme Q10 (CoQ10). A highly luxurious serum that imparts skin smoothness and delivers deep hydration, nourishment, and regeneration for a healthy, radiant and youthful-looking skin. 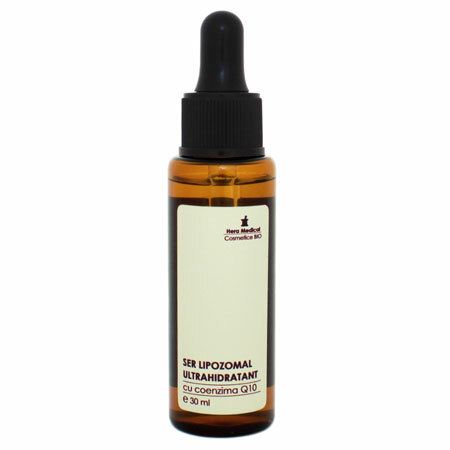 Rich, exclusive, multi-benefit, high-performance, and just deluxe, deluxe, deluxe, this is the liposome included ultra hydrating face oil carefully handcrafted with the freshest organic ingredients nature can offer. It imparts skin smoothness and hydration, treats wrinkles and dry skin, visibly improves elasticity, and leaves skin radiant. Lightens age spots and brightens skin tone. This is a proprietary formula that combines the therapeutic grade liposomal CoQ10 with 27 active organic botanicals rich in omega 6 fatty acids and vitamins – regenerating flower and plant oils, each highly targeted to work together synergistically to impart specific benefits to the skin. This intensely moisturizing, enzyme-rich botanical serum is enough to apply alone for a plump, deeply hydrated complexion. The small particle size of this lightweight formula deeply penetrates the skin layers and rapidly absorbs. Powerful, yet gentle. It can be used on all skin types, even the most sensitive. APLICATION: Use morning and evening. After cleansing and toning, pour 4-5 drops in your palms and smooth over damp face, neck, décolleté, and eye contour area. Optionally, follow with moisturizer. Finish with a facial mist. Apply morning and evening. After cleansing and toning, pour 4-5 drops in your palms and smooth over damp face, neck, décolleté, and eye contour area. Optionally, follow with moisturizer. Finish with a facial mist. SHAKE WELL BEFORE APPLYING. INGREDIENTS: UBIQUINONE (COQ10), VITIS VINIFERA (GRAPESEED) SEED OIL, SCLEROCARYA BIRREA (MARULA) SEED OIL, ROSA MOSCHATA (ROSEHIP) SEED OIL, BORAGO OFFICINALIS (BORAGO) SEED OIL, ALEURITES MOLUCCANA (KUKUI NUT) SEED OIL, OENOTHERA BIENNIS (EVENING PRIMROSE) OIL, RIBES NIGRUM (BLACKCURRANT) SEED OIL, HIPPOPHAE RHAMNOIDES (SEA BUCKTHORN) SEED OIL, ARNICA MONTANA (ARNICA) FLOWER EXTRACT, PELARGONIUM GRAVEOLENS (GERANIUM) OIL, CITRUS PARADISI (GRAPEFRUIT) PEEL OIL, CITRUS AURANTIUM DULCIS (SWEET ORANGE) PEEL OIL, CITRUS LIMON (LEMON) PEEL OIL, ROSA DAMASCENA (ROSE OTTO) ABSOLUTE, CITRUS AURANTIUM AMARA (NEROLI) FLOWER OIL, CITRUS AURANTIUM AMARA (PETITGRAIN) LEAF/TWIG OIL, DAUCUS CAROTA SATIVA (WILD CARROT) SEED OIL, JASMINUM GRANDIFORUM (JASMINE) ABSOLUTE, SANTALUM ALBUM WOOD (SANDALWOOD) OIL, ANIBA ROSAEODORA WOOD (ROSEWOOD) OIL, LAVANDULA LATIFOLIA (LAVENDER) OIL, CISTUS LADANIFERUS (ROCKROSE) OIL, BOSWELLIA CARTERII (FRANKINCENSE) OIL, COMMIPHORA MYRRHA (MYRRH) OIL, CYMBOPOGON MARTINI (PALMAROSA) OIL, POGOSTEMON CABLIN (PATCHOULI) LEAF OIL, TOCOPHEROL.